The Mastervolt Mass Combi combines the best of both worlds with an advanced battery charger and silent inverter rolled into one compact device. It is ideal for most boats from sloops to 16-metre yachts as well as for heavy mobile applications (the Mass Combi is E-mark certified). With two 48 V models added to Mastervolt s extensive range the Mass Combi is now also applicable in 48 Volt systems. 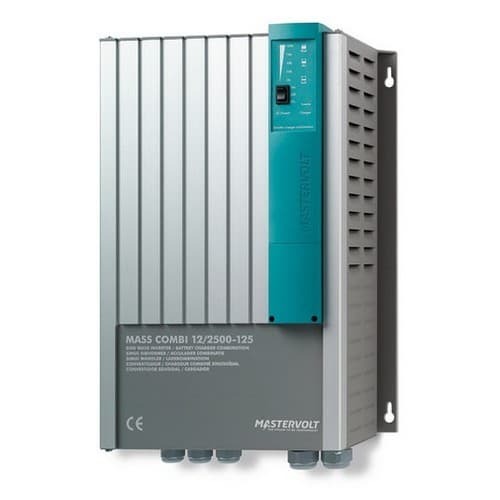 One of the key reasons for the Mass Combi s popularity is its versatility in power supply. The starter and service batteries are charged quickly and completely while the inverter provides silent and clean power. The Combi also has two separate AC outputs for light and heavy consumers. To prevent unnecessary depletion of the batteries heavy consumers such as washing machines or air conditioning are only powered when mains voltage or a generator is available. The design of the Mass Combi is both unique and characteristic of Mastervolt. Rather than installing heavy transformers our lightweight high-frequency technology offers major benefits regarding size weight and sound (no hum!). The technology also ensures an exceptionally high efficiency with a minimal conversion loss and a low no-load consumption. The Mass Combi meets all your requirements and more! Powerboost from battery when mains voltage is limited (mains/generator support). Charging two individual battery banks. Invert to 230 V/50 Hz pure sine wave voltage. Available in 12 24 or 48 V version. Multiple distribution and switching systems. Parallel function; two parallel Combis for even more power. The Mass Combi is CE and E-mark certified. The Mass Combi fits seamlessly within a MasterBus system. All components can be easily connected the system is simple and intuitive to use and requires far fewer cables for installation. One MasterView Easy touch screen panel controls the entire system displays information about the Combi as well as the batteries (via the MasterShunt) and operates the generator. The system can also be combined with Mastervolt s decentralised Digital Switching system.